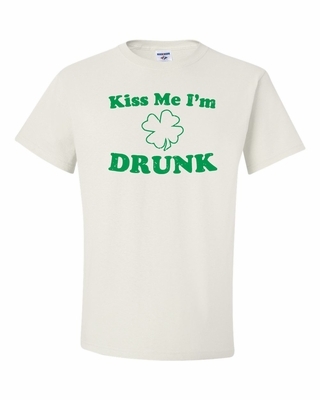 Perfect for St Patrick’s Day or any other day of the year you may be drunk, these Kiss Me I’m Drunk T-shirts are hilarious. And may even work. You don’t have to be Irish to enjoy a drunken smooch, but if you are Irish, then these Kiss Me I am Drunk T-shirts are a must-have. If you’re not Irish, these T-shirts are also a must-have. It doesn’t say you’re Irish; it says you’re drunk. Four leaf clovers are just good luck, so good luck to these hilarious T-shirts working out for you. Remember… you found the Kiss Me I'm Drunk Shirt at TShirtHub.com, where high quality came at a low price.